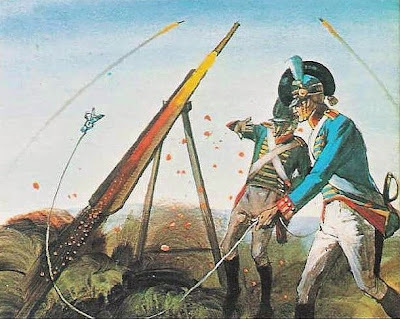 'The ''Congreve rocket'' was an important British military weapon designed and developed by Sir William Congreve in 1804. 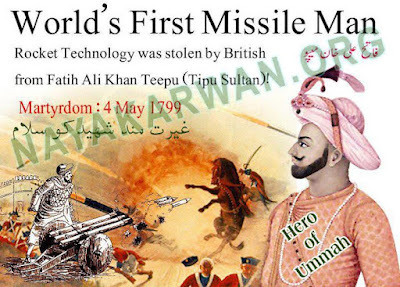 Tipu Sultan's Mysorean rockets were used as main models for the new version of Congreve Rockets and these were trump cards for the British military whose supremacy and prowess went a few scales up in the 1800s. These were introduced to frighten the French army which was a major threat to British imperialism. The development of this rocket by the Royal Arsenal was based on the knowledge and experiences gained at Second, Third and Fourth Mysore wars fought between the British East India Company and the Kingdom of Mysore in Southern India, During these wars rockets were the potent weapons strategically and intelligently used both by Hyder Ali and his son Tipu. Not only did they act as deterrent but the also had a severe impact on the British forces and, of course, on their morale as well. 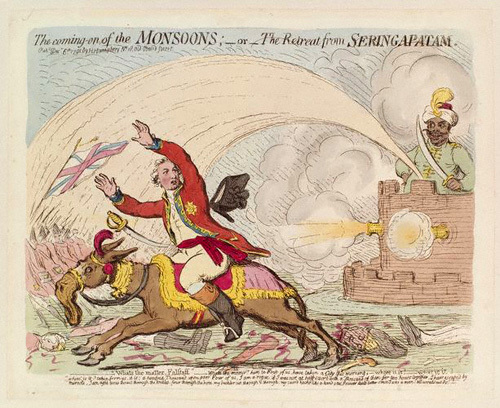 After the wars, several Mysorean rockets were sent to England for scrutiny and scientific analysis. In 1801, William Congreve founded a research and development program at the Arsenal's laboratory and undertook detailed studies on application of missiles in the battle fields. After several trials, the solid fuel rockets were first successfully demonstrated in 1805 by Congreve and his co-workers. They were used effectively during the Napoleonic Wars and the War of 1812. "So pestered were we with the rocket boys that there was no moving without danger from the destructive missiles ...". He continued: "The rockets and musketry from 20,000 of the enemy were incessant. No hail could be thicker. Every illumination of blue lights was accompanied by a shower of rockets, some of which entered the head of the column, passing through to the rear, causing death, wounds, and dreadful lacerations from the long bamboos of twenty or thirty feet, which are invariably attached to them." 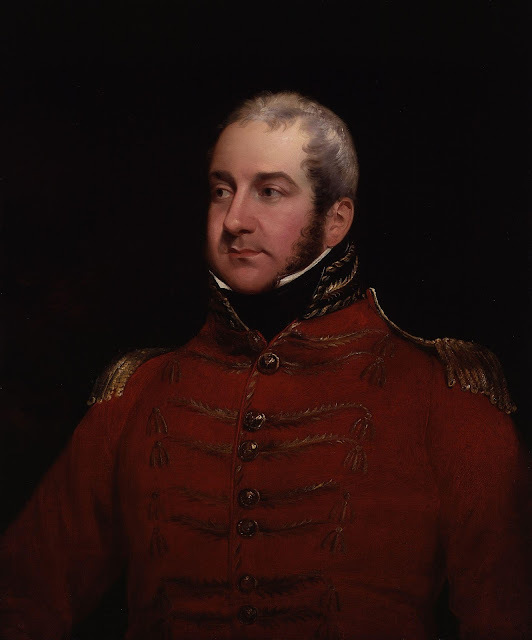 Sir William Congreve (20 May 1772 – 16 May 1828) was an eminent English expert in rocket artillery and their application in military warfares. He began a military rocket R & D program in 1801 exclusively for the British military's separate department of Royal Arsenal using the Indian rocket experiences and Hector Munro's book of 1789. Several rocket cases were additionally collected from Mysore and sent to Britain for analysis. The development was chiefly the work of Col. (later Sir) William Congreve, son of the Comptroller of the Royal Arsenal, Woolwich, London, The rockets were produced on a large scale according to R & D 's specification. Congreve was told that "the British at Srirangapatam had suffered more from the menacing rockets than from the shells or any other weapons used by the enemy." "In at least one instance", an eye-witness told Congreve, "a single rocket had killed three men and badly wounded others". 32 pounds (15 kg). His experiences at the lab using Mysorean rockets as models for better fire power and efficiency at last led Congreve to publish three books on rocketry. and are mentioned in the Star Spangled Banner.They played a major role in their victories in many wars which established them as a powerful nation. The highly innovative humble Mysorian rockets formed the bases of modern missile technology through the pioneering works of the British and the simple Indian rocket technology used in the Angelo-Mysorian wars gave the inspirations to the later rocket scientists. Werrett, Simon. ‘William Congreve’s Rational Rockets.’ Notes & Records of the Royal Society 63 (2009): 35-56. The Chinese invented rocket artillery in the first half of the 11th century. 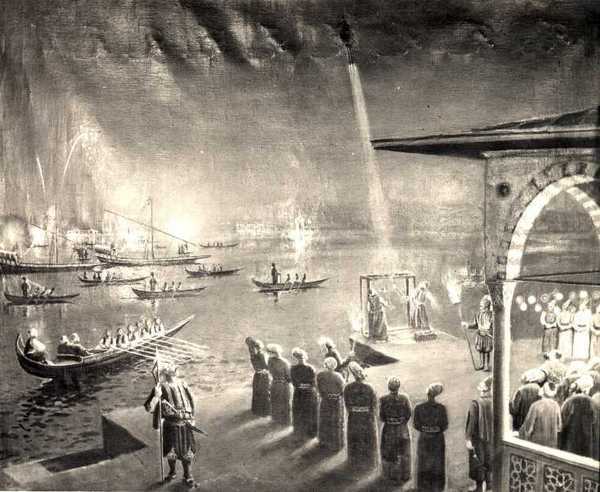 The Indians and Arabs learned rocketry from the Mongols after the Mongols took it from the Chinese in the 13th century. Yes, the British did study the construction and use of Indian rockets to inform immediately subsequent designs, but rocket artillery had been in use in Europe for over three centuries before the Congreve rocket design specifically. This is great and informative post. I really like this interesting and valuable post.